I've managed to ruin a small project. First time that happens to me. Guess there's always a first for everything. I was stitching a little kitten charm freebie. Don't ask me where I found it, I can't figure it out anymore. I tried but it's got some Japanese signs on and I can't read that so I haven't got a clue. 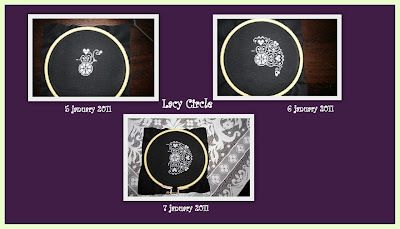 Guess that's what happens when you try out something new whilst having the flu! I think I'm going to try and stitch it again, on plastic canvas this time, but not immediately. 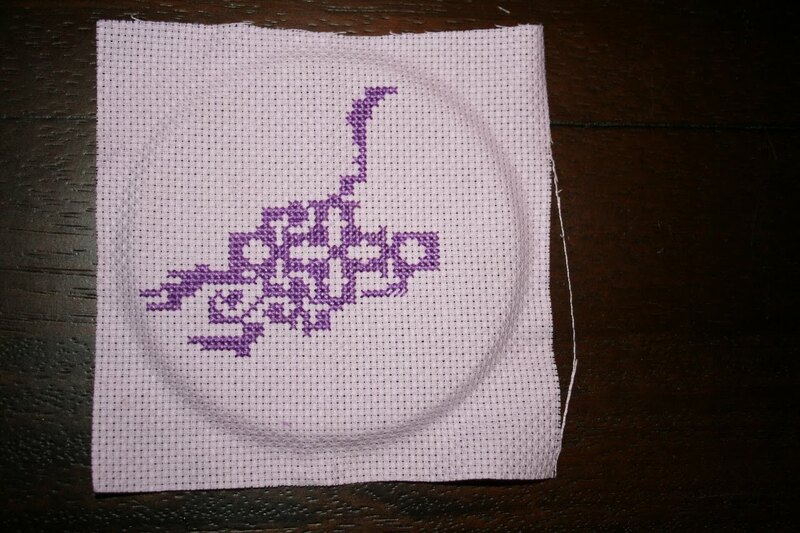 So I'm going to continue stitching that one. Starting the letter "H" today. Looking lots better than the kitten charm if you ask me!!! Signing off for now, will be back soon! I've got a bit of the flu so I'm not going to be around much at the moment. I just wanted to show you a picture of the nice valentine cube Marion made using my design. 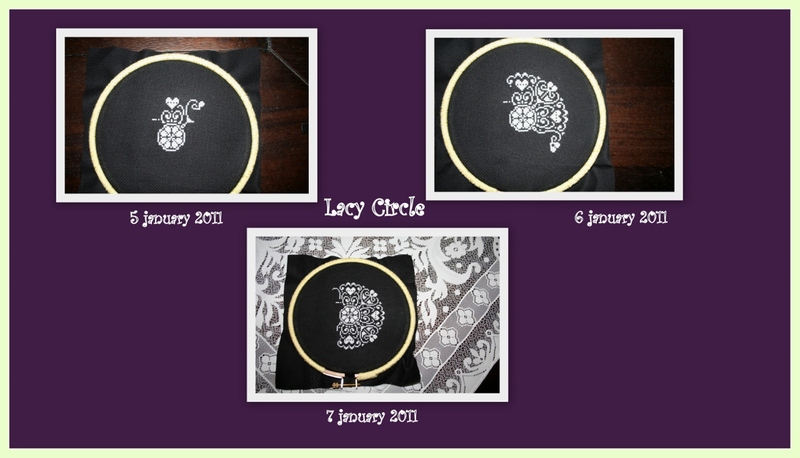 I'm so glad she sent me a mail, i's always nice to receive pictures of what you make with my little designs! THANKS!!! Signing off for now. Can't really concentrate on anything. I know some of you are eagerly waiting to find a certain kind of cat design here and I hope I don't dissapoint them by putting up 2 more valentine designs instead. But, rest assured, my cat design will appear very soon! But, as Valentine is near I decided to pamper you with some singing hearts! 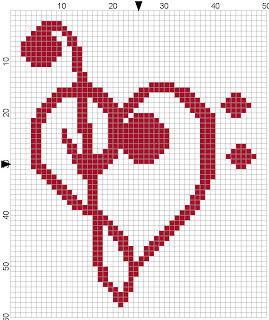 In a small grid version and a bigger one. 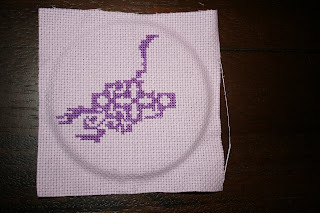 It's up to you which you prefer and which you want to stitch. 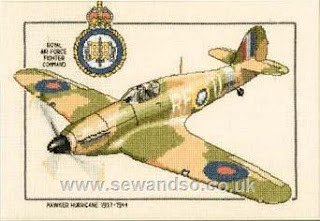 I personally like the big chart and I might stitch it, though I haven't got the foggiest idea when that would be... At the moment I'm stitching another freebie of mine to show you somewhere next month and after that's finished I have to start stitching this Hawker Hurricane as a present for my nephew who'll be 8 next month and who's just discovered WWII and it's airplanes. Enough about cats and airplanes for now. It's time for some singing hearts! Yes, yes, yes, I know you want cats! And I promise you, the next charts will be cats!!! 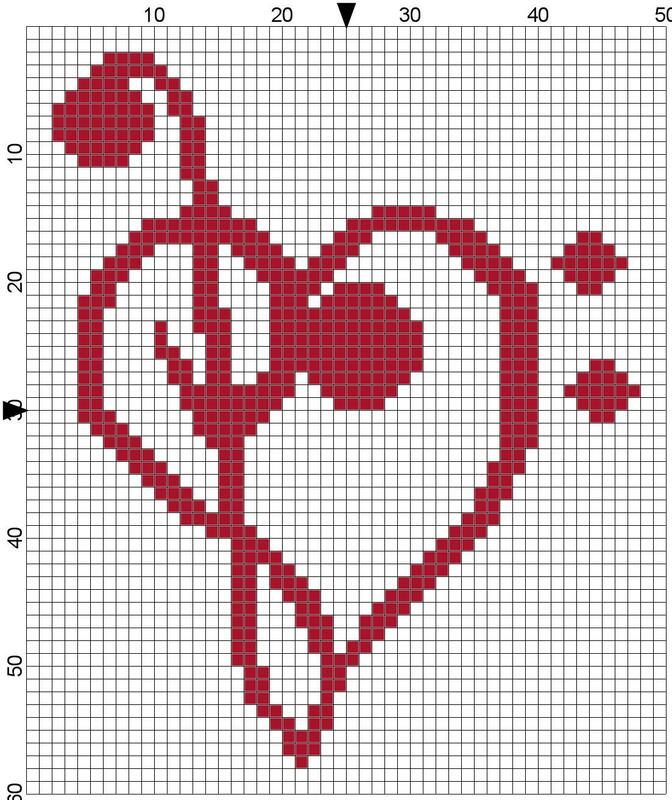 In the meantime, I hope you like my singing hearts and please send me pictures of your stitches! I'll be sure to put them up on my blog for everyone to drool at. Miaow Miaow for now and thanks for the visit! 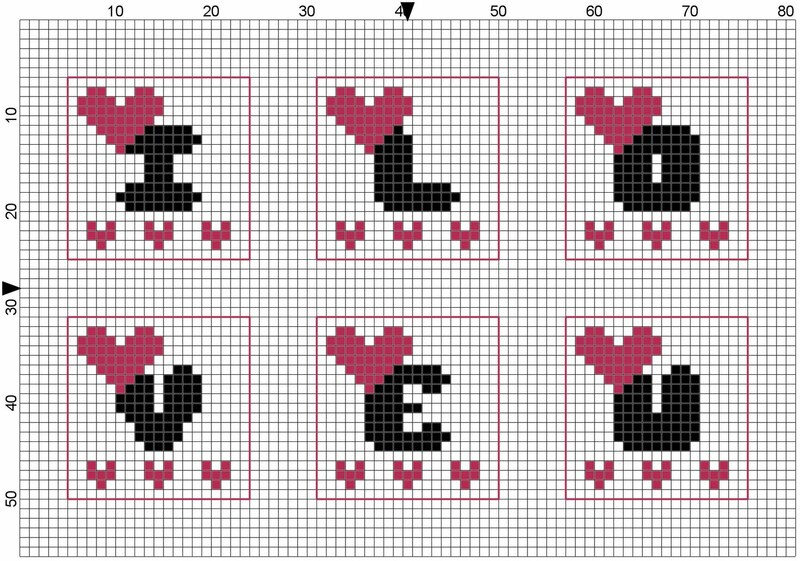 Want to stitch someting for Valentine maybe? What about this cube key ring? I've stitched it on plastic canvas and it's looking good! 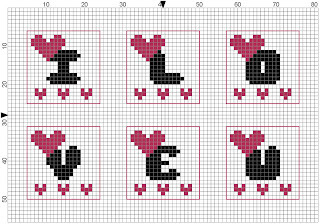 It's rather simple to make, 6 sides, 6 letters: I LOVE U and a lot of hearts that's all there is to it and it says it all! 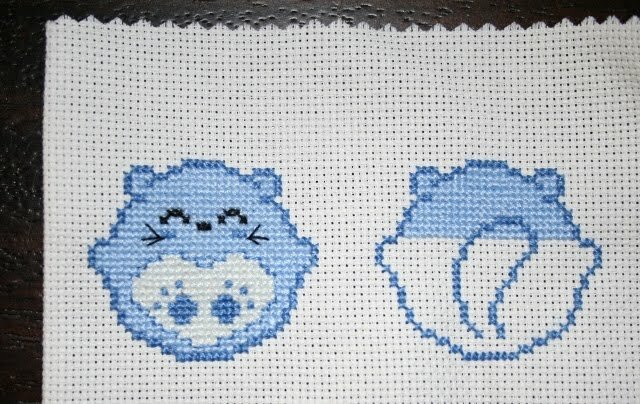 Hope you like it and if you stitch it, be sure to show me the results! Totally, utterly and completely fed up with it! Yes, that's right. This had to become a biscornu but all the frogging I did to get this far isn't worth it anymore. Not only did I have to frog like a pro but I also managed to stitch my crosses in different directions. All in all the whole bleedin' thingy drove me nuts! So yesterday I decided to quit trying to make it and started a new one. The new one looks promising too and I'll tell you more about it later. Right now I don't have time as I've still got some household chores to attend to.... yuk! I told you I was going to finish it! Looks wonderful, even if I say so myself! Only problem is I'm not very creative when it comes to displaying it. The only things I do is put it in a frame or a hoop. 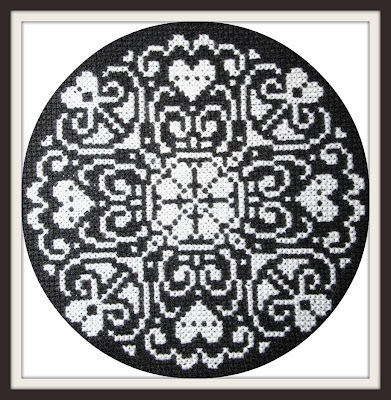 I'd like to do something different with this design, like making a little round cushion, but I'm not too sure how to do it and I don't want to ruin it trying. I'd like to find on line tutorials showing pictures on how to do it, but I don't know what to google for. If anyone reading this knows a good site, please let me know! You'd make a blogger very happy indeed! Thanks in advance! In the meantime I started stitching a biscornu. I'll tell you more about that next time but for now all I can say is that it makes my eyes squint and I've had to frog it more than once. Sounds promising doesn't it?! Have a nice sunday wherever you are! Me who's not a fan of anything smaller than 14 count aïda managed to find a piece in my stash that was not only black but also something like 18 count. 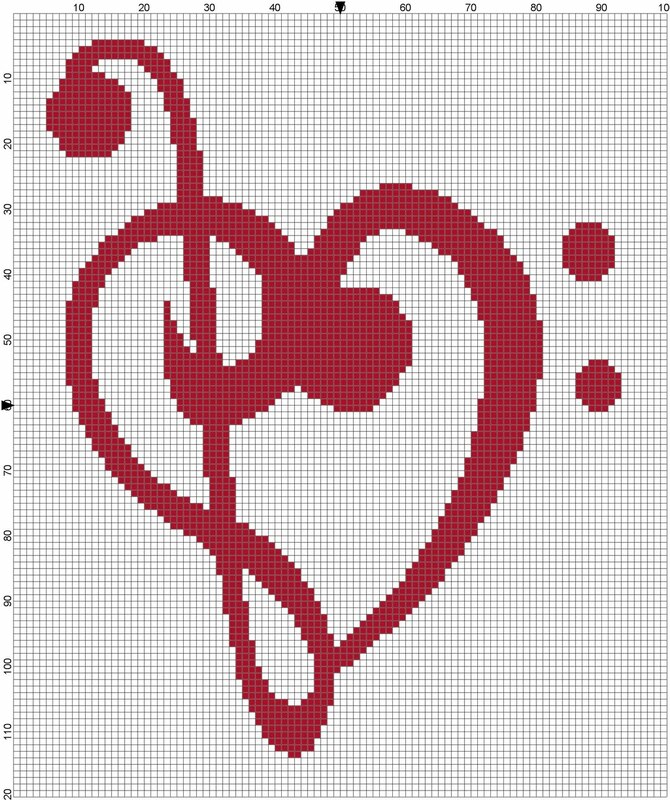 I only realized the count when I was already stitching this design and even though it's rather difficult and strenuous for my eyes, I rather like the result so far and I'll finish it for sure! This design is yet again a freebie from a French blog les grilles de liselotte. Scroll down on the main page untill you see "catégories" on the left side. 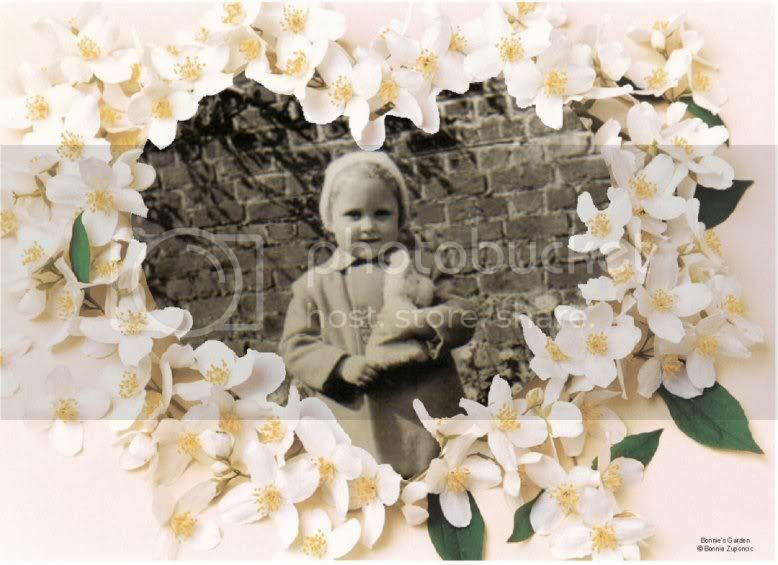 Underneath that title you can find "griselottes" and when you click you will be able to find other similar designs. I'm currently making n° 7. I might be able to finish it as the weekend started for me. I'll let you know next time when I'm around. 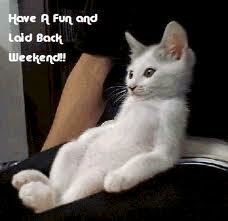 Enjoy and have a nice weekend too!